Owners of any of Roland's latest range of HP/LX premium digital pianos will see that there are 255 GM2 instruments available under 'Other > GM2' sounds. However, these are not listed in the piano's manual nor anywhere else I can find, and the instrument descriptions can be a little vague. 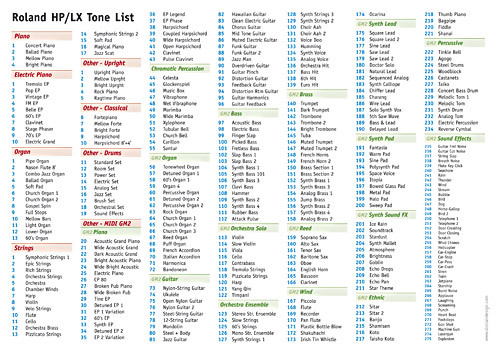 This blog post corrects this situation, and offers a full GM2 sound list (with MIDI patch and bank numbers, and Roland's reference numbers) in two formats: HTML (below) and PDF (see the download links on the right). 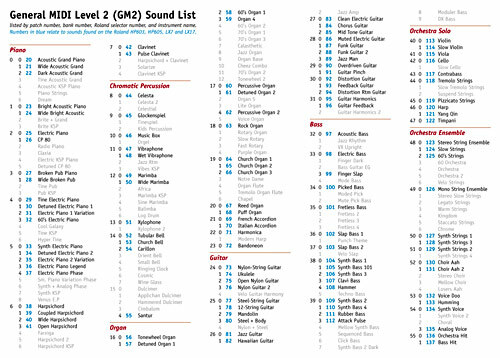 Also available for download as a PDF is (1) a single A4 page listing only the GM2 sounds found in the Roland HP603, HP605, LX7 and LX17; and (2) a single A4 page listing the full set of sounds and tones found in the Roland HP603, HP605, LX7 and LX17, up to and including firmware update v.1.05. General MIDI or GM is a standard or specification for MIDI enabled synthesizers, designed to ensure that a labelled sound created on one MIDI instrument has a degree of consistency with all other MIDI instruments. General MIDI 2 or GM2 extends both the number of available sounds in the standard, and the amount of control available for sound editing and musical performance. Further technical information can be found on the website of the MIDI Manufacturers Association. The following GM2 sound list is derived from Wikipedia and includes the Roland reference number (as used on HP603, HP605, LX7 and LX17 digital pianos) for Roland's equivalent sound in each case. This is not an authoritative list as Roland do not publish their specification - not that I can find, at least - but most of the sound names match up exactly with Roland's labels, and those that do not are not difficult to work out. If you disagree with the data mapping of any sound, please leave a comment below. 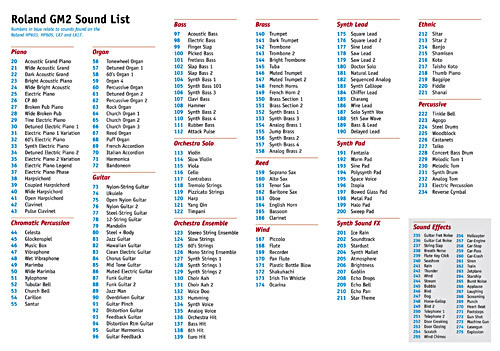 The downloadable PDF presents the sound list in a much more meaningful way, on both sides of a single A4 sheet, for owners of Roland digital pianos from the HP/LX range.